which is commonly known as Bolgatty Island is amongst the oldest creations of Dutch. This amazing mansion which was established around mid 17th century was later broadened and adding to its brilliance the gardens were established to preserve its essence. To understand the historical importance of the Bolgatty palace one would require travelling back to the days of Dutch administration when they took a throne from the hand of Portuguese and started influencing their power over locals with their trade relation. Traveler must understand that the sole purpose behind erecting an amazing wall of the Bolgatty palace was to serve the governor of the Dutch which however became a resident of commander of Dutch Malabar. It was during the call of 90s the palace was given to the British colonials in lease to serve the interest of British governor. Impetus of Indian independence allowed newly form government to take over the seat of the palace which was however renovated and was transformed heritage hotel resort. Sprawled over an area of around 8 acre the vast stretch of land which is occupied by an essence of lawns and old trees carries the wisdom of Dutch architecture. The wooded decoration of the palace which is complimented by the large halls, pillars and tiled roofs makes it authentic and historical beside that it was the first palace built by the Dutch outside their nation so from that perspective it owes narrative implication and connotation. Within the palace traveler would have an opportunity to view the glory of mesmerizing surroundings beside that its tranquilizing nine-hole golf course sets its class apart as compare to other palace around India. 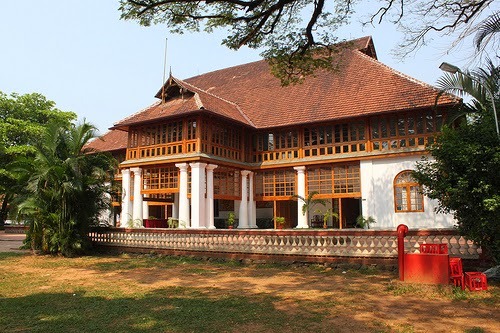 With an idea to preserve its testimony the tourism department of Kerala after gaining control over its property transformed the palace into heritage hotel. As a hotel it has earned special impetus perhaps its location for that matter plays a decisive role. Its magnificent lawn which is complimented by the silent flow of backwaters and scenic revelation makes it exclusive and illustrious. Within the house of two storied blocks of Bolgatty palace you are sure to feel a quintessence of history beside that its colonial plinth that supports the whole of palace would draw you back to the days of Dutch administration. Leisure ambience of the Bolgatty palace has honeymoon and lakefront cottages, executive suites and deluxe rooms at the edge of the waterfront to give its guest the sense of living within the comfort. Beside that it’s recreational activities and perks of adventure assorts like golf course, Ayurvedic and spa centre, multi cuisine restaurant makes it steadfast of the palace. Traveler must understand that it is amongst the best palace of India crafted by the Dutch to improve their relation with Raja of Cochin so it seeks traveler attention to understand its chronology. Beside that its tourism importance speaks the volume although the transformation must have laid back its importance but its true relevance is nevertheless an example for us to understand colonial captivation.